If you're on the lookout for a casual yet stylish getup, pair a white crew-neck t-shirt with black leather skinny pants. Both items are totally comfy and will look fabulous together. For something more on the daring side to finish off this getup, choose a pair of white leather low top sneakers. If it's comfort and ease that you're looking for in an outfit, try pairing a N°21 n21 asymmetric sleeve t shirt with black skinny jeans. We're all ensembleing for comfort when it comes to dressing up, and this combination of a N°21 n21 asymmetric sleeve t shirt and black denim overalls is a good illustration of that. When it comes to footwear, this outfit is complemented wonderfully with gold leather flat sandals. Reach for a N°21 n21 asymmetric sleeve t shirt and black leggings for a lazy Sunday brunch. Team a N°21 n21 asymmetric sleeve t shirt with blue ripped skinny jeans, if you feel like practicality dressing without looking like a hobo. Kick up the cool of your outfit by finishing off with red suede ankle boots. 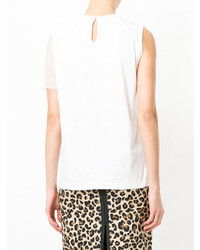 If you're after a casual yet chic getup, wear a N°21 n21 asymmetric sleeve t shirt from farfetch.com and light blue skinny jeans. Both pieces are totally comfy and will look fabulous paired together. When it comes to shoes, this outfit pairs nicely with black chelsea boots. 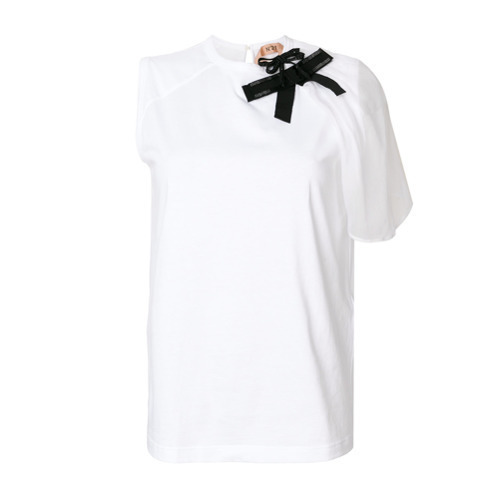 If you're hunting for a casual yet totally chic outfit, team a white crew-neck t-shirt with black tapered pants. Both pieces are totally comfy and will look fabulous together. For something more on the daring side to round off this getup, rock a pair of dark brown leather flat sandals. If you're scouting for a casual yet chic getup, rock a N°21 n21 asymmetric sleeve t shirt with blue skinny jeans. Both items are totally comfy and will look fabulous together. Got bored with this ensemble? Enter black cutout leather ankle boots to shake things up. We all look for comfort when it comes to dressing up, and this combination of a N°21 n21 asymmetric sleeve t shirt and grey denim leggings is an amazing example of that. You could perhaps get a little creative when it comes to footwear and elevate your ensemble with black leather chelsea boots.